From Dr. Vinod: As we prepare for Thanksgiving, I would like to share a story about my own family. My grandchildren surprised me with a Diwali gift. Under their parents’ guidance, they had split their piggy banks into Spend, Save, and Share compartments. They saved money from their allowance and chores and wanted to donate their “share” to IDRF! My grandson, age 10, donated $75 to provide books and other supplies to needy kids; he wants poor children to be able to get a good education. 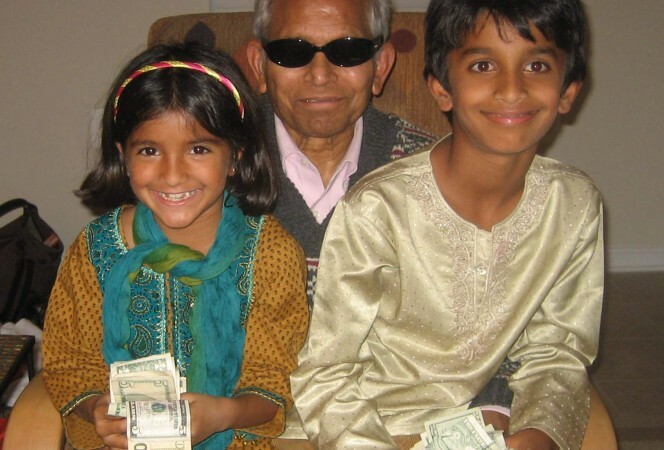 My 7-year-old granddaughter was also eager to help children and the beggars she had seen on her visit to India. She wants every child have fun in school like she does. Their smiling faces remind me of why it’s so important to inculcate compassion and empathy in our children. While the stores want us to shop on Black Friday and Cyber Monday, thousands of people will celebrate compassion by making donations on Tuesday, December 3, “Giving Tuesday”. I hope you and your family will join this new holiday and donate to IDRF next Tuesday. PS: All online donations, and checks mailed on Giving Tuesday, will be matched by an anonymous donor! ← Donors Give IDRF 5 Stars!